This design features the Chinese phrase “百年偕老”, which literally means that a couple “will become old together after 100 hundred years”. So, this implies that the couple will stay together for the rest of the life. The phrase is presented as calligraphic characters. 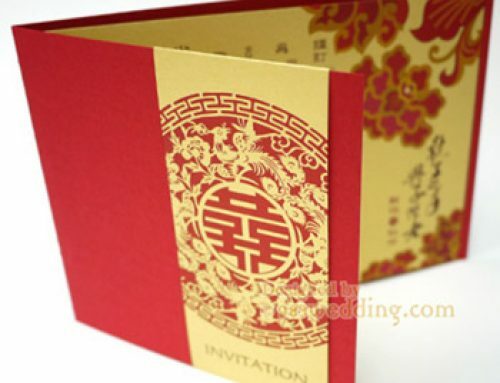 It is used to enrich the Asian touch of the invitation. 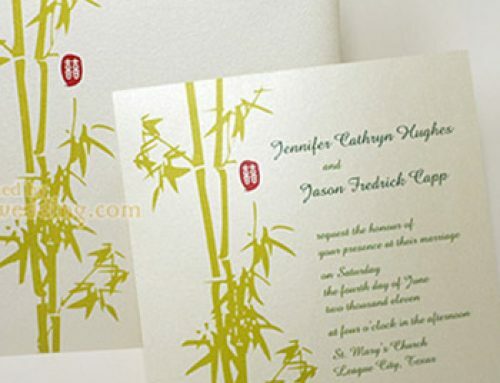 With dancing phoenix and blossom flowers around the double happiness symbol, it expresses the happiness and joy of getting married. 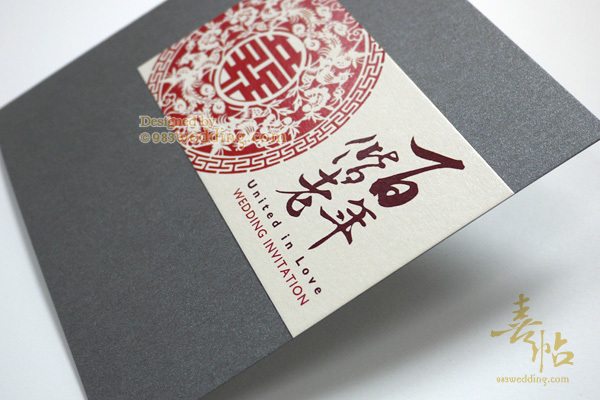 We have chosen an unusual color for the design of this modern Chinese wedding invitation – the gray color. In fact, using some unusual colors is always one of the methodologies to create new designs. And this also makes this particular design exquisite and unusual. In fact, the name of this design should explain this main color scheme. We choose the gray color to subtly signify the idea of having gray or silver hair. 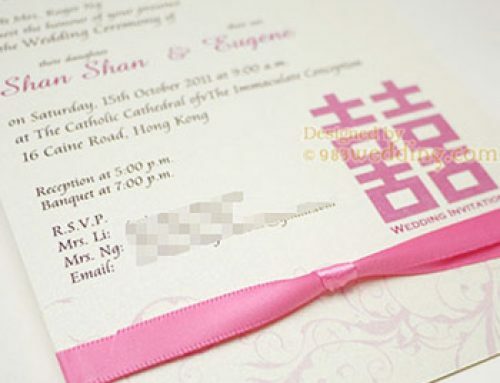 Although the main color is something unusual, the graphic elements used are not. 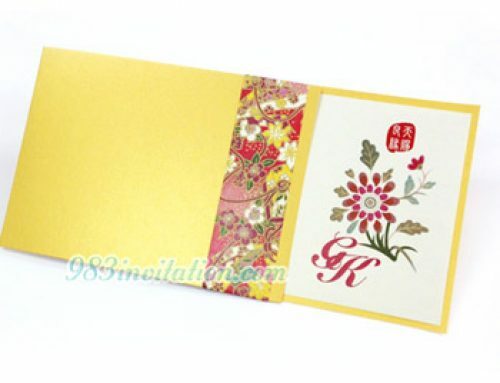 They are elements that you can find from traditional Chinese wedding invitations. 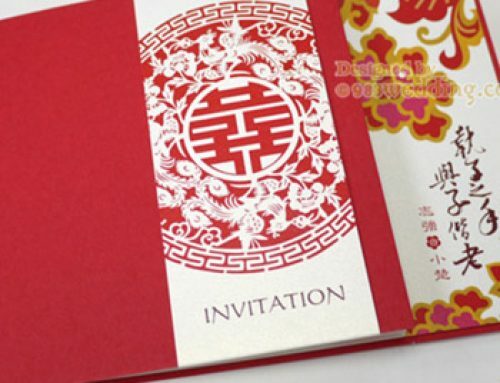 Double happiness and Chinese calligraphy are the two essential elements of this design. We keep the Chinese red color when we print the double happiness symbol. 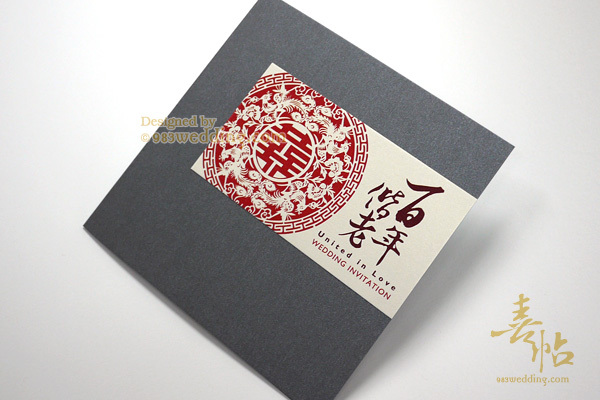 When it comes to the part of the Chinese calligraphy, it is printed in deep brown color. As mentioned, the characters used are “百年偕老”. This reinforces the notion that the bride and groom will be a couple until all the hair turns gray. This is something very romantic, right? In order to create a visual interest, all the patterns and calligraphy described are printed on a piece of pearl color strip. The strip will then be glued to the gray color paper. In fact, you may not be seen the graphics clearly if they are printed directly on the gray color cover. The use of a pearlized strip also helps to bring out a color contrast between off-white and gray. The insert will be in light pearl color. Double happiness and wordings will be printed on it with gray tone. This echoes the main idea of hair turning gray together. Besides, it is also possible to print the words “百年偕老” on the insert if it is needed. However, we will only recommend this if you are going to print one language of wording only.